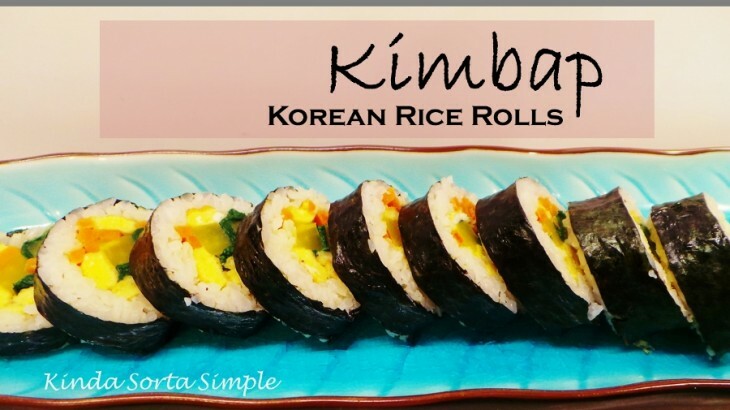 Kimbap is by far one of my favorite Korean foods to make AND eat. They are great for a snack, for on-the-go, for lunches, and especially yummy at, well… any time! I grew up with my mom making them, stuffing the gim, or seaweed sheets, with all sorts of goodies like rice, egg, cucumber, and more. 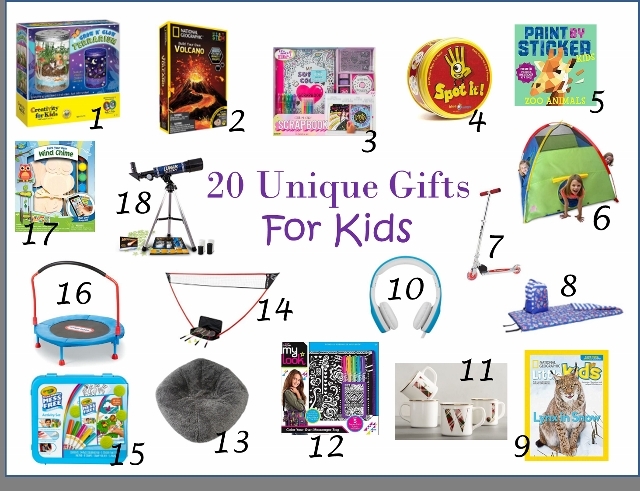 It would be an understatement to say that my kids love them as well. 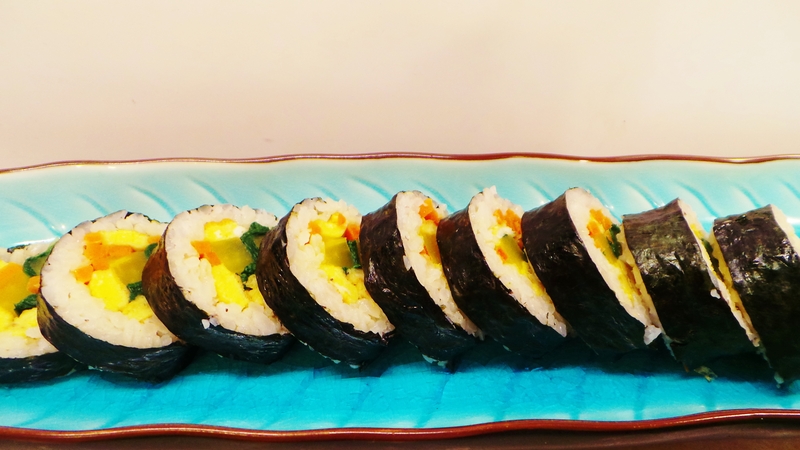 If you are not familiar with kimbap it is a staple in Korea. Simply, it is rice, veggies, egg, meat, and whatever else your heart (and stomach) desires, all wrapped up in rice and a dried seaweed sheet. When I visited the country many years ago I remember seeing these sold at every corner store, wrapped in plastic wrap and ready to eat. When I was running late for classes at Ajou University, these were my go-to snack to eat on my way to school. 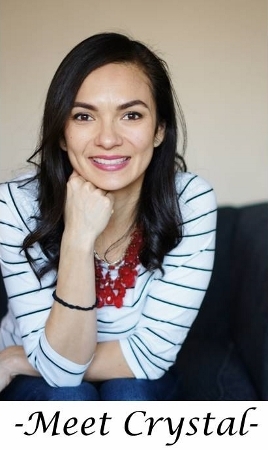 The convenient part of the recipe is that you can really use whatever veggies and ingredients you have in the fridge as long as you have gim and rice. 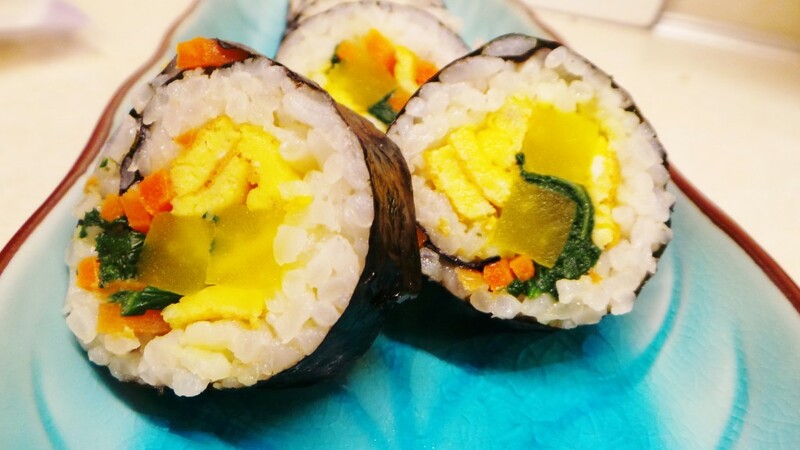 The bright yellow ingredient we used in these kimbap pictured is yellow radish, found at Korean markets. 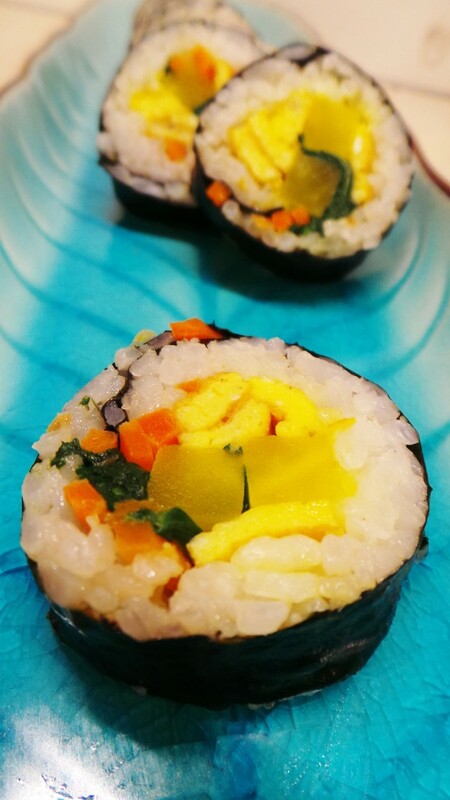 The kimbap you see here were made by the kids with each one choosing the ingredients they wanted to include in their own kimbap roll. So much fun and tasty too! Try not be intimidated by the length of the recipe. 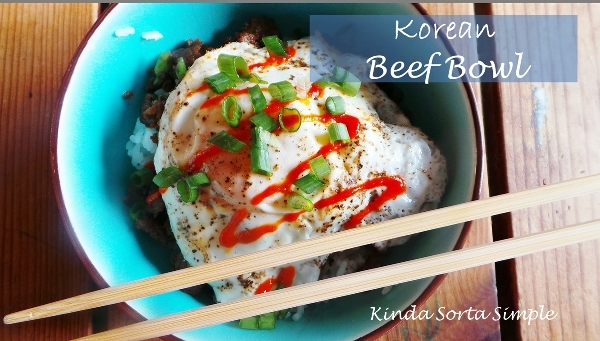 It is similar to my bibimbap , or Korean Rice bowl recipe where you need to prepare a couple of different ingredients individually before putting it all together. 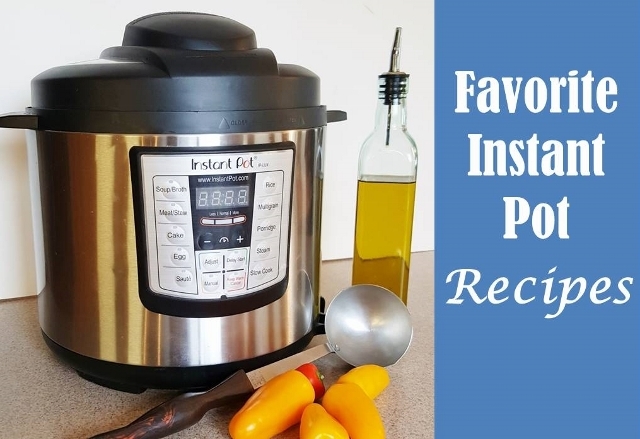 It takes only a few minutes for each ingredient however, so overall does not take long. Also, a tip is to place the ingredients on a tray as you finish each one as opposed to using a bunch of bowls. What’s better than less clean up? 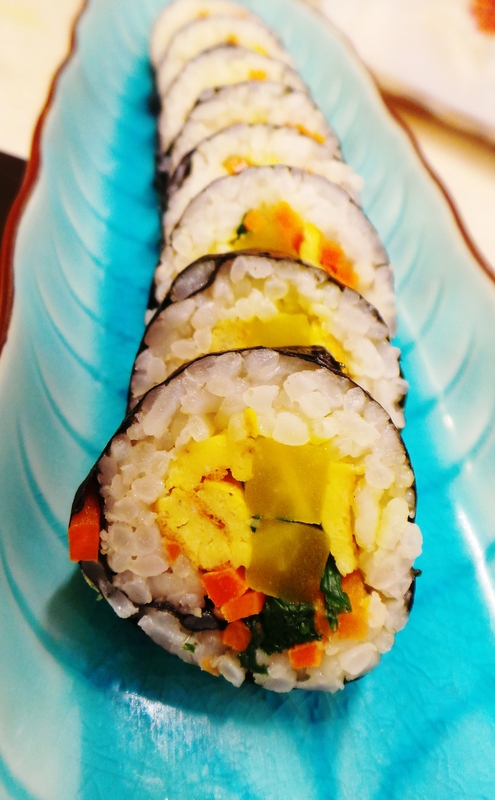 Kimbap is a fun recipe to make with kids and is healthy, delicious, and a great snack any time of day. Place the rice in a large bowl and mix with 2 tsp sesame oil and a pinch of salt. Beat the eggs in a small bowl, add a pinch of salt , then over medium heat cook the eggs in a medium sized frying pan. Be sure to rotate the pan so that the egg spreads evenly and thinly over the surface of the pan, similar to making an omelette. When cooked through, slide onto a cutting board and cut into ½ inch strips then set aside. Boil the spinach for about 2 minutes before rinsing in cold water to stop the cooking. Squeeze the spinach to remove water then place in a small bowl. Add a pinch of salt, ½ tablespoon minced garlic, and 2 tsp sesame oil to spinach and mix thoroughly. Set aside. Cut the imitation crab into ½ inch wide strips, set aside. If using beef, cut into thin strips, about ¼ inch thick and place into medium bowl. Add 1 tbsp soy sauce, ¼ tsp ground black pepper, 2 tsp sesame oil, ½ tbsp minced garlic, 1 tbsp sugar and mix thoroughly. Set aside to marinate while cooking carrots. Combine carrot matchsticks with a pinch of salt. Add some vegetable oil to a small frying pan on medium high heat and stir fry the carrots for 1 minute then add to a small bowl and set aside. Heat a medium size pan over medium high heat and add a tbsp vegetable oil and the marinated beef. Stir the beef until cooked through, a few minutes, then pour into a bowl and set aside. Now you have all of the ingredients it is time to assemble! If you are familiar with how to roll sushi this will be easy because it is the same technique. Using a bamboo sushi roller place one sheet of seaweed on top of the roller. Add ¾ cup-1 cup of rice to seaweed and spread thinly across the sheet leaving about an inch of space at the top of the sheet. Carefully place pieces of the filling in the center of the rice, making a line across horizontally. Roll the kimbap starting from the bottom, being sure to squeeze the roll tightly as your roll. Be sure to not roll the mat up into the kimbap! When finished, I like to add a few smashed pieces of rice to the 1 inch space of the kim to help 'glue' the seam closed (thanks mom for the tip). Repeat with the remainder of the ingredients. When finished, cut the rolls into 1 inch pieces using a sharp knife. It helps to have a wet paper towel nearby to wipe blade clean between cuts to ensure a cleaner cut. What recipes does your family enjoy making together? 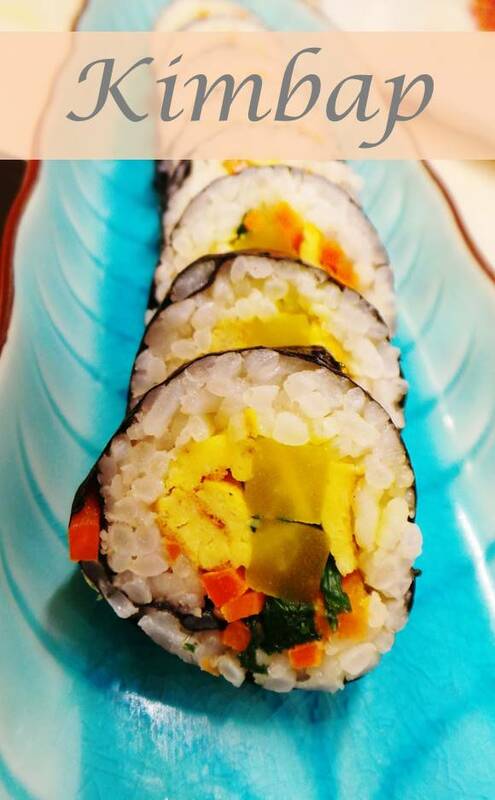 All, Food kimbap, Korean, recipe. permalink.